The ICC is pleased to present The Minnitts of Anabeg with Irish film director and script writer Alan Brown. This Irish feature film tells the story of the most important time in Irish history: the effects of English rule on Irish society and one man’s fight to save a community while struggling to save his family. Following the showing of the film, director Alan Brown will speak on the making of the film. ICC Presents: Summer Baking with Master Irish Chef Brendan Cronin. Tuesday, August 13th. 8:00pm. $25 Members, $30 General Admission. Chef Brendan Cronin from Co.Mayo, Ireland is the only Irish chef to attain the prestigious Swiss culinary title of ‘Chef de Cuisine Diplome’. 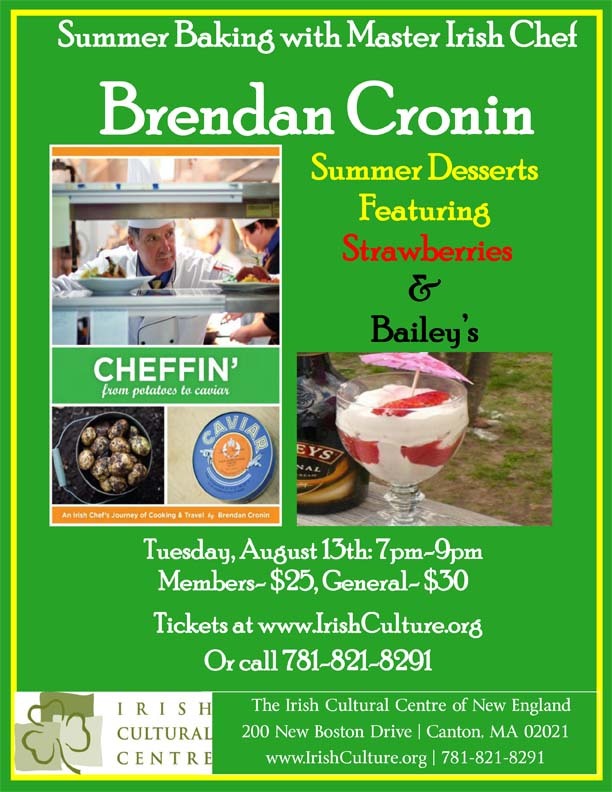 Brendan Cronin will demonstrate two favorite summer desserts that include strawberries and baileys! This is a perfect way to spend a summer evening with friends in this relaxed and informative Irish baking class. Registration in advance is required. Tickets for any of these events can be purchased at www.IrishCulture.org or at 781-821-8291.